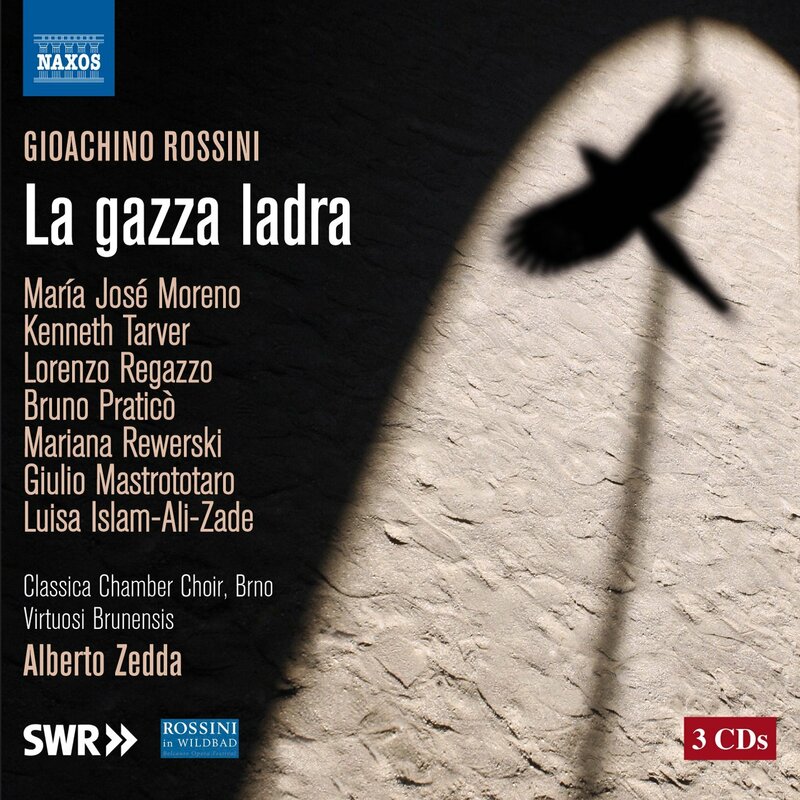 Rossini's comic operas seem to make an arc of development from the early one act farse through to the opera semi-seria La gazza ladra (The Thievish Magpie), which was his final Italian comic opera. Its blend of comedy and tragedy has meant that it frequently remains best known for its overture! 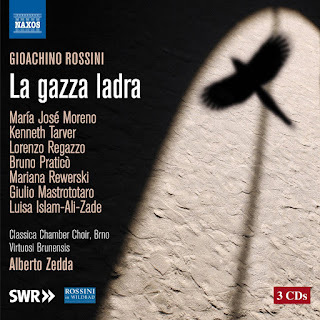 This new recording on Naxos from Alberto Zedda was recorded live at the Rossini in Wildbad Festival with a cast including Giulio Mastrototaro, Luisa Islam-Ali-Zade, Kenneth Tarver, Maria Jose Moreno, Bruno Pratico, Lorenzo Regazzo, Mariana Rewerski, Stefan Cifolelli, Pablo Cameselle, Maurizio Lo Piccolo and Damian Whiteley. Zedda conducts the Classica Chamber Choir, Brno and the Virtuosi Brunensis with Gianni Fabbrini providing fortepiano continuo. The recording was in fact made at the 2009 festival and has had to wait until now for its release. Zedda conducts his own critical edition and thus makes the set rather desirable for Rossinians. In fact the opera has not fared particularly well on disc and the most highly recommendable recording in recent years has been the English language one on Chandos. Part of the problem is that the piece requires a large cast with two buffo basses, three substantial female roles and the tenor hero not to mention a host of comprimario roles making a total of 11 in all. The other problem, though, is the work's reputation sitting uneasily between comedy and tragedy, with a plot which seems to land bits of a rescue opera quasi Fidelio in the midst of The Barber of Seville. After his work on the early farse, Rossini explored what a comic opera could be and how to develop it. Perhaps it helped that he worked for such a long time in Naples where he wrote opera seria with only one comic opera, La gazzetta, and that not for the main opera company. The great comic works, Il barbieri di sivigla, Cenerentola, L'Italiana in Algeri and Il Turco in Italia were written for other houses. And in them we can see Rossini trying to bring real characters into comedy, so that a works like Barber and Cenerentola present characters with humanity to them in ludicrous situations, whilst Il Turco in Italia experiments with the whole structure of the opera in a Pirandellian manner. In La gazza ladra these experiments come to fruition, and we have a relatively serious plot with characters of great humanity who nevertheless behave sometimes in a comic manner. That the Podesta has a brilliant comic patter song does not make him any the less fearsome; Rossini and his librettist Giovanni Gherardini recognise that there is a fine line between someone being comic and being threatening. The opera is based on a French play, from a genre of rescue drama popular in early 19th century Paris (a genre which would give rise to Cherubini's Lodoiska and Beethoven's Fidelio). Inevitably such works have a happy end, here arising by accident, and seasoned opera goers would recognise the genre from the way many opera serias ended. Alberto Zedda and his forces pay the work the compliment of taking it entirely seriously, allowing the moments of pathos to speak without ever compromising the comic nature of some elements. It helps that Alberto Zedda has two great buffo basses in the cast, Bruno Pratico as Fernando, the heroine's father, and Lorenzo Regazo as Gottardo, the Podesta and the heroine's nemesis. Lorenzo Regazo gets the comic patter song, which he executes with brilliance and is still suitably menacing in the second act (when he turns on the heroine because she won't give in to his advances) Lorenzo Regazo might be singing a comic part, but he can still spin a lovely line too. The same is true of Bruno Pratico brings a lovely humanity to Fernando, complete with a lovely duet with his daughter in act two. The Spanish soprano Maria Jose Moreno as Ninetta makes a delightfully girlish heroine and she manages the complex vocal line with ease and not a little charm. She has a highly characterful voice with a slight edge to it which gives Ninetta a sense of spirit, and which Maria Jose Moreno uses with intelligence. Occasionally, perhaps, the fioriture are not quite ideal but then the recording is made live and has the advantage of great vibrancy. The role of hero Giannetto is not a huge one, he is only one of many in the cast, but Kenneth Tarver brings real quality to his singing and imbues Giannetto with robust vibrancy which gives the rather passive character more spine. Where the opera relatively unusual is in the degree of prominence given to Lucia (Luisa Islam-Ali-Zade), wife of Ninetta's employer and putative mother-in-law (she's Giannetto's mother). Luisa Islam-Ali-Zade brings a big, vibrant mezzo-soprano to the role. She has great control and is thrilling in her arias, though sometimes the tone tends to harden. She is the other threatening character, and Luisa Islam-Ali-Zade really uses her voice to bring that over, without an excess of comic mugging, which makes her capitulation at the end in her Act 2 aria all the more moving. The other prominent role is the young man Pippo (Mariana Reweski) who is also in love with Ninetta. Mariana Reweski brings real charm, and a nice sense of style. The remaining roles are strongly cast, this isn't one of those sets where the subsidiary roles let down the principals. Here we get a fine ensemble, and it helps that the performances were recorded at a live staging. There is a real sense of the drama, with recitatives which zip along with feel of dramatic involvement. Gianni Fabbrini provides a stylish forte-piano accompaniment which complements the drama. Alberto Zedda in the pit is entirely tireless, and gets a lively and attractive performance from Classical Chamber Choir, Brno and Virtuosi Brunensis. He makes everything zip along nicely, and everyone brings a nice sparkle and sense of verve to the score. The CD booklet includes detailed track information and summary but no libretto (You can get the Italian language libretto from the Naxos website). Alberto Zedda contributes a fine article putting the opera in context. The real sense of theatricality, and a strong ensemble cast make this a highly desirable set, particularly at Naxos's attractive prices. Many lovers of the opera will want Chandos's English language version, which remains highly recommendable, but this is a strong contender for an Italian language set.